The smartwatch movement inspired me recently, which is surprising because I haven’t worn a watch since I started carrying a smartphone many years ago. I’m about as far as you can get from being a fashionista and I liken a watch to other obsolete single-use devices like the GPS. I doubt I’ll buy one anytime soon but I believe the device synchronization model used by smartwatches lends itself to content distribution as well. You’re probably aware of how most smartwatches get paired with your smartphone. Although they don’t have all the capabilities of a smartphone, things like text messages and phone calls can be redirected from your phone to your watch, thanks in large part to Bluetooth technology. Your phone communicates with your watch the same way your phone connects with a wireless headset or desktop Bluetooth speaker, for example. Let’s fast-forward to the day when we’ve all become peer-to-peer content distributors. Rather than relying on centrally-managed and hosted sites and services that handle everything from reviews to downloads, this peer-to-peer model means we’re doing all that for each other using Bluetooth or some other simple networking protocols. For example, your phone or computer can easily be turned into a wifi server, allowing you to connect multiple devices to it; that's a capability that exists today and I'm suggesting it could be extended for new uses in the future. The Kindle introduced a whole new level of reading privacy. Once upon a time on a crowded bus you could see the cover of the book being read by the person across the aisle. Now we’re all masking our reading habits with tablets and phones. No, I’m not suggesting we embrace an overly intrusive model that has privacy advocates screaming in the streets. Rather, I believe a peer-to-peer model could be used to improve discovery and consumption at the hyperlocal level. Think of the hundreds of riders on a commuter train each morning. Maybe they’re traveling from the northern suburbs into Manhattan. Some of them are neighbors. Many of them are businesspeople. All of them probably follow and read some type of news. Instead of just knowing the top global trends on Google, wouldn’t it be interesting to know what news stories your fellow commuters are reading? The same concept can be applied to passengers on a plane or even homeowners in a neighborhood. Just as NextDoor.com has disrupted Angie’s List and brought communication and recommendations to the local level, I suggest a peer-to-peer model could do the same for content. The peer-to-peer aspect really shines when you consider how the content gets from my device to yours. That news story I just read on TheGuardian.com still lives in my browser’s cache. If enough of my fellow commuters read the same article, it floats to the top of the popular news list for our little commuter community. You click the link to it in our peer-to-peer content app and the article is pulled from my cache to your device. In short, we’re distributing content to each other, without having to go up and down, to and from a central server. Wouldn’t this be terrific on a 4-hour flight with no wifi? Each of our devices acts as a mini-server, hosting content for everyone else. Publishers would freak out over this model, at least initially. They’ll no longer control distribution and it will create holes in their analytics. I’m sure most, if not all, publishers have something buried in their terms and conditions preventing this sort of thing, but those who want to embrace broader distribution and consumption will eventually warm up to it. Btw, the model isn’t limited to web pages. Think about the benefits this offers the book publishing sector. What if you could see a list of the popular ebooks in your neighborhood or among your fellow commuters? And what if you could pull a sample of one of those popular titles from someone else’s device, again, a particularly useful solution when you’re outside wifi and cellular range? If you decide you like that sample and you end up buying the ebook your peer-to-peer commuter friend gets credit for the sale with an affiliate cut of the resulting transaction. We place way too much emphasis on the ability to measure global trends. You see it every day on Google, Twitter, etc. While we all care about these global trends, we’re also keenly interested in local and hyper-local trends. This peer-to-peer model addresses that point while also providing some relief for data plan limits and spotty wifi coverage. First up, my employer, John Wiley & Sons, Inc., just reported outstanding results for the fiscal year we completed on 4/30. Congrats to the entire Wiley team! Next up, Don Felder's Heaven and Hell. Who's he? The guy from The Eagles who wasn't Don Henley, Glen Frey, Joe Walsh, Randy Meisner or Timothy B. Schmit. Seriously, every time I watched their Hell Freezes Over DVD I kept asking myself...who is that guy?! Well, it turns out he's an incredible author with a fascinating story to tell. Wiley recently published Felder's Heaven and Hell and a copy hit my desk last week. Bear in mind I was a bit of an Eagles fan, but not a huge one. I totally love the Hotel California album but that's about it for me. When I started reading this I thought I'd be bored by the story of Felder's youth and all the pre-Eagles coverage. Wow, was I wrong. His story is fascinating from page one and the writing is exceptional. I'm not quite halfway through it and can't wait to read more. I'll have a full review shortly but if the rest is half as good as what I've already read this one will quickly become one of my all-time favorites. Speaking of PITA's, how about that wacky HSE School Board? They're at it again. First they blow money right and left on severance packages and now the local paper had to save them from making the incredibly embarassing mistake of offering the superintendent job to a candidate whose previous employer paid a settlement on a sexual harassment lawsuit that he was facing. Given all the recent gaffes I figured this would be a tough slot to fill. The new superintendent will either have baggage, like this one did, or they haven't studied the history close enough to know they should run from the opportunity. And who's the recruiter the Board has working on this?! Jeez, are they unable to do simple background checks? Oh, HSE School Board, is their any type of embarssment you're unwilling to bring upon yourselves? As a reader of this blog there's a pretty high likelihood that you not only realize the online predator problem but you have also taken some steps to protect your family. It's probably the less web-savvy parents out there that really need better guidance...or are they the only ones struggling? I don't think so. As a parent and someone who uses Norton's Parental Control product as another layer of security, I thought I knew all the facts about safeguarding my kids online. 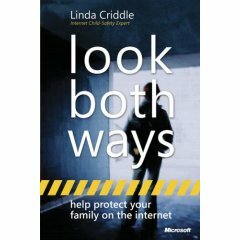 Now that I've had the chance to read Linda Criddle's book Look Both Ways, I can see how naive I've been. The book is full of practical how-to advice that's critical for any parent of kids who are browsing, chatting, blogging, etc. Loads of checklists are used throughout and Linda builds the bulk of the book around her "13 Steps to Internet Security." If you're a parent, do yourself a favor and buy a copy of this book. Perhaps more importantly, if you know any parents who aren't all that well-versed in online safety measures (and we all know at least one, right?! ), buy them a copy as a holiday gift. This is a problem that isn't going away anytime soon, so it is best to follow the advice of an expert like Linda Criddle. I attended the annual Shepherd Community banquet last week and got to see one of our local newspaper icons win an award. Gary Varvel, editorial cartoonist with the Indianapolis Star, was given the H. Dean Evans Legacy Award for his ongoing community service efforts. I’ve always enjoyed Gary’s cartoons in the local paper and I truly appreciate his perspective. Gary is also a blogger and I encourage you to take a look at what he has to say. You’ll find it’s a great resource for anyone interested in current events as well as aspiring illustrators. Also, if you’re an Indianapolis resident and you’re looking for a great service organization to get involved with, I highly recommend you hook up with the folks at the Shepherd Community Center. Take a look at the list of services they provide inner-city families. There are plenty of ways you can help them accomplish their goals, whether it’s volunteering your time or sending them a donation. I’ve been fortunate enough to work with some of their staff over the past couple of years and I’ve found it to be an awesome organization.